Port wine it seems was discovered in the 17th century when British merchants added brandy to the wine of the northern Douro region to prevent it souring and to improve its shelf-life during shipment to England. The wine was called Port, after the port city of Porto. Since Warre’s established the first British Port House in 1670, much of Portugal’s port trade has always been in the hands of the British, even up till current times. In 1790, a century after the establishment of Warre’s British Port House, The House of Sandeman was founded by George Sandeman. With a loan of GBP 300 from his father, George Sandeman started dealing with Portuguese and Spanish wines. By 1795, he had established an agency in Cadiz (Spain), dealing with sherry wine, and in 1811 he purchased cellars in Gaia (Portugal), dealing with Porto wine. In 1877 the Sandeman brand was registered as a trademark. They were the first company to brand their casks thus giving the wine a name that assured quality. At the end of the nineteenth century “brand” names were quite unheard of, but Sandeman wanted to give their customers a guarantee of quality. So, in 1880, they became the first Porto House to export bottled and labelled wines. By 1914, the brand had a network of agents who were selling Sandeman wines worldwide. Sandeman’s famous trademark “the Don” was painted by George Massiot Brown in 1928. 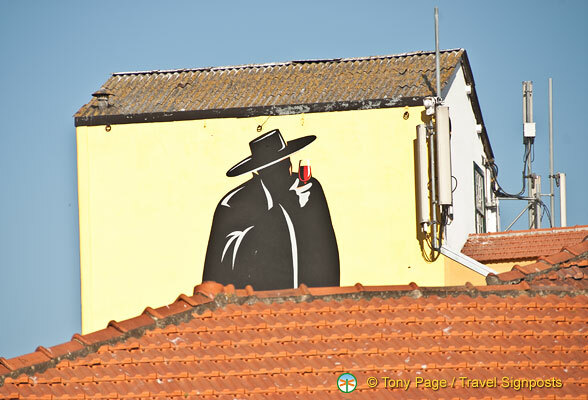 The mysterious Don, in his black cape, wide-brimmed black hat and glass of port in hand was based on the Portuguese student’s black cape and a Spanish Caballero hat. This trademark has won much acclaim and recognition internationally for the Sandeman brand. Sandeman’s Quinta do Seixo is their grape growing region in the Demarcated Douro Region and covers an area of 99 hectares. Sandeman today is recognized worldwide as a Porto wine brand and is distributed to over 55 markets. The current chairman of the company is a seventh generation Sandeman, also by the name of George. When in Oporto, you can visit The House of Sandeman in Vila Nova de Gaia or take a trip to Quinta do Seixo where you can taste selected Porto wines. See Travel Signposts House of Sandeman Photo Gallery HERE.